The Friday keynote event (4:15pm -6:15pm) will remain in the Katzen Recital Hall. These location changes are also updated in the web page and Eventbrite links at the end of this story. The second biennial Trans Philosophy Conference will take place on American University’s campus from Oct. 5 – 6. "Thinking Trans // Trans Thinking" aims to continue to explore trans philosophy -- philosophical work that is accountable to and illuminative of transgender experiences, histories, cultural production, and politics –- and to define philosophy’s place within the field of transgender studies. Since the first conference in 2016, the field of philosophy has been roiled in debate about the legitimacy of trans philosophy, the ethics of publishing on trans people, and recent trans-exclusionary policies and recommendations in the United States and United Kingdom. Not every scholar engaged in the discussions has a background in gender theory, trans studies, or trans philosophy. A divide has resulted. The tenor of some of these discussions in philosophy has even led to coverage in higher education news outlets. Some scholars are wondering how trans philosophy, a young subfield within philosophy, will weather the storm and attract or retain Ph.D. candidates. Zurn and his conference co-organizer, Andrea Pitts of University of North Carolina-Charlotte, are trying to redirect the conversation not only through the upcoming conference but through an endeavor known as The Trans Philosophy Project. The professors received grants to create a bibliography and resource center on trans philosophy scholarship. “When it comes to marginalized experiences, people feel like they can just weigh in with their own opinions, as if there isn’t a body of literature they need to consult or read first,” Zurn said. “We’re collecting and curating that body of literature for trans philosophy. Then we can point people to this and say, ‘Here, read this stuff first.’” In this way, Zurn and Pitts hope to build on transgender studies’ commitment to generate scholarship in which trans people are considered producers of knowledge, not simply objects of study or problems to be fixed, Zurn said. At the same time, Kris Sealey of Fairfield University, alongside Amy Ferrer (American Philosophical Association), Rebecca Kennison (K/N Consultants), Yannik Thiem (Villanova University, also attending the conference next month), Adriel Trott (Wabash College), and Kyle Whyte (Michigan State University) received a planning grant from the Andrew W. Mellon Foundation to explore working toward a code of publication ethics for philosophers. Among other aspects, the scholars involved are considering citing and engaging literature from marginalized fields or written by marginalized scholars as ethical principles of scholarship, especially if one is weighing in on debates about them, Zurn said. Zurn believes these efforts will help. The resources he and Pitts are compiling will provide philosophers, as well as scholars working in other areas who are thinking through trans issues and questions, a place to go. Simultaneously, a code of publication ethics will create ethical guidelines for research in philosophy. Conferences also provide expertise on these issues, Zurn said. 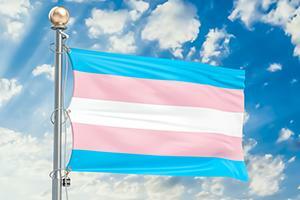 The conference sessions in October will highlight the diversity of trans experience. While some sessions will focus on the effects of racialization and colonization on trans populations, others will explore trans people’s negotiation of medical norms and disability, for example. The keynote speakers will address these issues as well. Also at the conference, the Richard L. Schlegel National Legion of Honor Award will be awarded. The award is named for Schlegel, an AU alumnus, and recognizes individuals who have exhibited leadership and contributed to the dignity and freedom of LGBTQ people. For more information, including conference logistics, visit the event page. To register, visit Eventbrite page. The conference is free and open to the public.